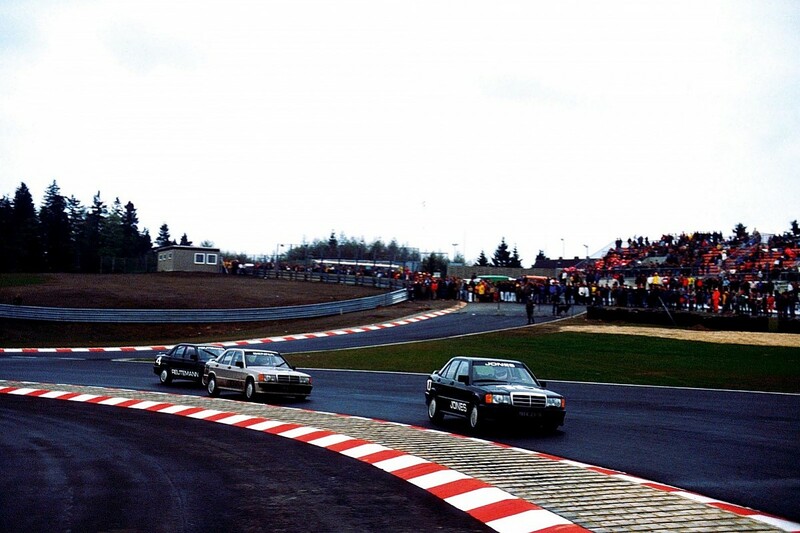 Prost and Senna were headed to the 'Ring to represent the new guard of Formula 1 in a one-make race for Mercedes 190E saloons, featuring a grid packed full of world champions: Niki Lauda, Keke Rosberg, Alan Jones, Jody Scheckter, James Hunt, Jack Brabham, John Surtees and more. Senna had been drafted in only to replace his countryman, the Indianapolis 500-bound Emerson Fittipaldi. A bit of fun? Sure... until they pulled on their crash helmets. The Prost-Senna bonhomie ended abruptly when Alain outqualified Ayrton, the pair locking out the front row. In the race, Senna muscled Prost off on the first lap - neatly foreshadowing what was to come - and won, much to the annoyance of Mercedes, who had wanted a 'name' to win their showcase. A few weeks later, Prost's McLaren would win a truncated Monaco GP in heavy rain, the early finish thwarting what would have been a shock victory for Senna in his Toleman. Both races foreshadowed the most dramatic and bitter rivalry in F1 history - and what would become the defining chapter in McLaren's epic narrative. Four years on, in 1988, as F1 prepared for a final season with turbo engines and McLaren began a promising new partnership with Honda, Prost claimed he could have vetoed Senna's arrival at 'his' team. Now a two-time world champion and a core component of the McLaren-TAG game-changing superpower, Prost's opinion carried weight. Instead, and to his credit, he advised Ron Dennis to overlook new world champion Nelson Piquet and sign Senna, because, he reasoned, McLaren deserved the quicker driver. It was advice he would quickly come to regret. At that point, Prost had no reason to fear Senna, despite the younger driver's explosive one-lap pace. Later, looking back at their two combustible seasons together in '88 and '89, Alain would admit that Ayrton did "astonish" him - but only in qualifying. On race day, the pair were equals, sharing the high ground above the F1 support cast. It was all about these two. For Prost, he found himself in a scenario much like that at McLaren in 1984 - but now transposed to the other role. Back then, he'd been the young charger coming in to unseat the established champion. Team-mate Niki Lauda knew from the off that he couldn't live with Prost's outright pace, but won his third world title through preparation, graft and race-day guile. Alain watched, and learned. Now he was the veteran to be shot at and, like Niki, he'd need all his experience to deal with the upstart threat in the vivid yellow helmet. That first season, when Honda's power propelled McLaren to an unprecedented 15 victories from 16 races, all was remarkably calm in the camp. Only at Estoril, where Senna almost drove Prost into the pitwall at the end of the first lap, was the accord strained. Yes, Senna had blitzed Prost on Saturdays by 13 pole positions to two, but on Sundays the Frenchman scored more points - 105 to 94. 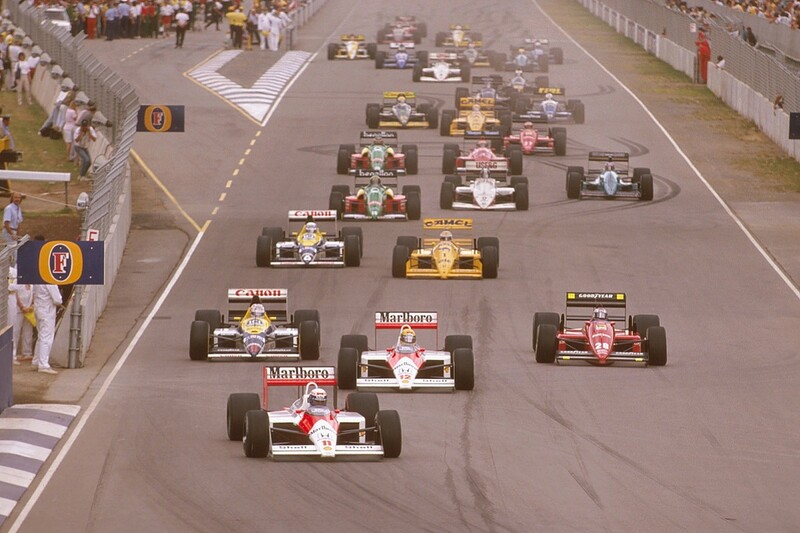 However, on the 11 best scores rule to which 1988 played, Prost's seven victories and seven second places fell short of Senna's eight wins and three runner-up finishes. Ninety points played 87 in Senna's favour. Alain took defeat well. After all, he already had two titles, Senna had taught him nothing new and, again, there was nothing to fear for 1989. The switch to normally aspirated power for the new season changed little at the sharp end of the F1 world order, as Honda's V12 picked up where their V6 turbo left off. On the chassis front, sure, Gordon Murray's low-slung influence from Brabham had contributed to the blitzkrieg MP4/4 designed largely by American Steve Nichols and his team, but as maverick visionary Murray turned his focus to an ambitious McLaren road-car project, strength in depth and best-practice foundations dating back to the John Barnard era meant his diversion caused barely a ripple. McLaren, in Ron Dennis's vice-like grip, were the perfect F1 racing team. But like many an indomitable empire, an all too human factor would now undermine them. War broke out at Imola, where a pre-race deal suggested by Senna to hold station at the first corner was complicated by a restart after Gerhard Berger's fiery shunt. Senna reneged on the pact second time round, passing a fuming Prost at Tosa. Senna's zealous self-belief, underpinned by a religious conviction that plain scared his team-mate, helped him justify his actions. But once confronted by Dennis, he was reduced to tears. 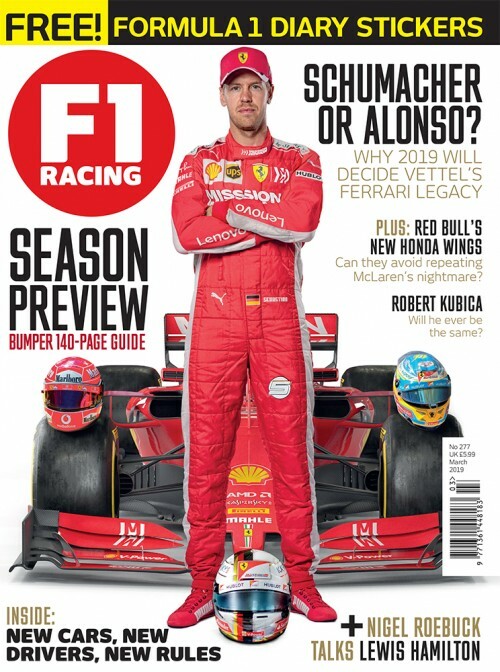 The accord between McLaren's drivers now lay in tatters, and no one - not Dennis, nor even team co-ordinator Jo Ramírez, who had somehow remained a confidant to both - could repair it. By Suzuka '89, the intensity was unbearable. It was like watching Jaws: gripping, yet exhausting to the point you just wanted it to be over. For Prost, it had already become too much. Torn from the fabric of the team he'd done so much to establish, he'd committed to Ferrari for '90, enraging Dennis by dropping his trophy from the Monza podium to the cheering tifosi below. 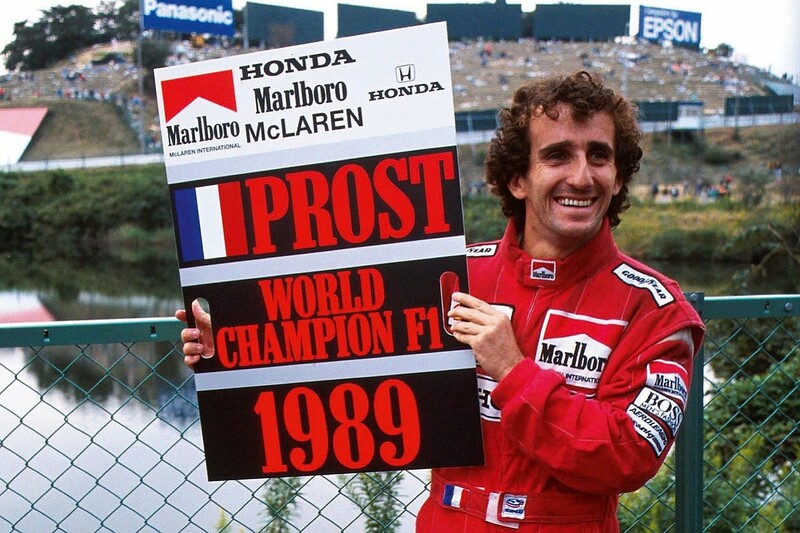 Prost had grown convinced of disparity within the ranks - not on McLaren's part, perhaps, but certainly from Honda, who appeared to favour Senna's samurai ethic over Prost's clinical science. 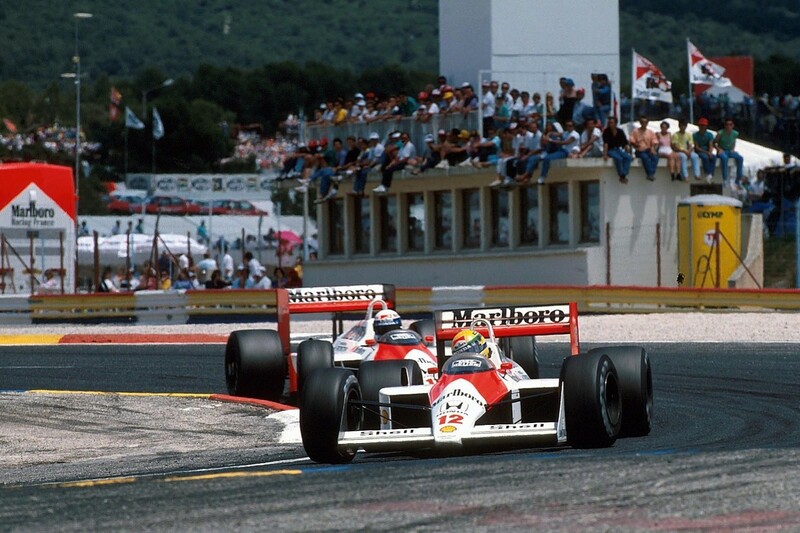 The superteam were divided: Prost a McLaren driver powered by a Honda engine, Senna a Honda driver in a McLaren chassis. 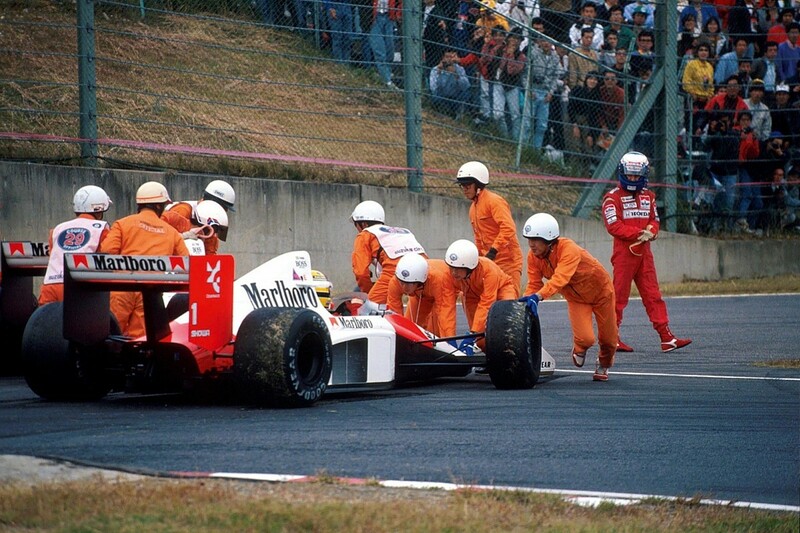 The climax - that clumsy collision at the Suzuka chicane, Senna's recovery drive and trumped-up exclusion for cutting the corner as he rejoined - was unseemly. Now it was Prost's turn for justification through petty semantics. When Senna made his lunge, Prost hadn't driven into him; he'd simply refused to "open the door". Not his finest moment, and you sensed he knew it - but it won him a third championship. The bitter war raged on into 1990 as Prost now invigorated Ferrari. Amazing performances and race drama again kept us hooked, but the denouement this time, again at Suzuka, would plunge F1 to a desperate low. Senna's calculated decision to drive Prost off the road at 150mph at the first corner, in front of the whole pack, remains the most reprehensible act committed by an F1 driver. The deification of a man justifiably considered by many as the greatest of all time goes on, nearly 25 years after his death. But Suzuka 1990 will forever undermine Senna's monumental legacy. Just as it had following Diego Maradona's 'Hand of God' moment at the 1986 World Cup, sport shifted off its axis as the dust settled in the Suzuka gravel trap. And then it was all over. Ferrari's competitive decline in '91 and a new threat posed by Nigel Mansell's Williams-Renault took the edge off the feud, and the racing world sighed with relief. Senna's third and final world title was perhaps his finest, despite lacking the intensity of a Prost rivalry, because suddenly McLaren and Honda were on the back foot. Not even Senna could hold back the tide of traction control, ABS and Adrian Newey-inspired aerodynamic superiority that carried Mansell to the '92 crown. But as Prost engineered his way into the best seat in the house for 1993, Senna found himself consumed by jealousy. His old foe had got under his skin once again. Prost had always been Senna's target, from that first encounter in the Mercedes 190E, and now, once again, Prost had the upper hand. Ayrton didn't even have Honda in his corner; the Japanese manufacturer had devastated McLaren by quitting F1 at the end of the 1992 season in the face of a crippling global recession. Then again, the make-do customer Ford V8 solution, mated to the neat, well-proportioned MP4/8 chassis, at least provided a suitably fiery coda to Senna's McLaren years. The apparent injustice of his disadvantage brought out the best in him - behind the wheel, at least. After all the pouting and sulking, he got what he wanted for '94: a Williams-Renault, as Prost took his leave with a fourth title, unwilling and unable to stomach a rematch of '88-89. 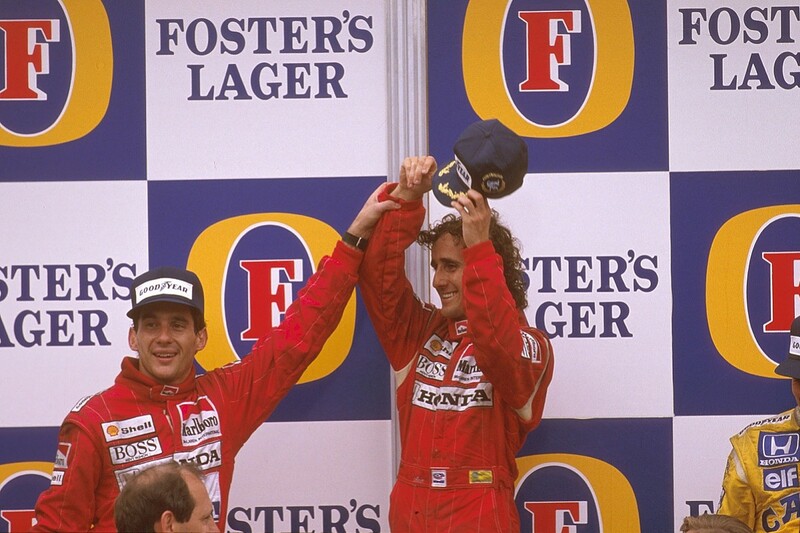 Immediately following Prost's final race, in Australia, on an emotional podium, the friendship that could have taken root in that car journey 11 years before, finally began to blossom - only to be cut short so tragically on 1 May 1994. For McLaren, the world kept on turning. But the hangover of the Prost/Senna years would prove painful and enduring. In Mika Häkkinen, who piqued Senna by outqualifying the maestro first time out at Estoril in 1993, Dennis and his loyal team at least found a new muse. But they lacked the power to uphold the standards McLaren had come to stand for. By today's standards, the 1990s wilderness years seem far less barren than they appeared at the time. But it was surely humbling for Dennis to have to resort to Lamborghini's unsophisticated V12 for '94, only to then turn to an unproven Peugeot. If it was, he didn't show it. The sneer of superiority never wavered: he had faith in what was to come. As Michael Schumacher succeeded Senna as F1's brilliant-but-flawed enfant terrible, McLaren's regeneration began, in partnership with another superpower. Mercedes had dominated grand prix racing in the 1930s and mid-50s. Now, 40 years after the 1955 Le Mans disaster that had killed more than 80 spectators and driven a horror-stricken Mercedes from the sport, they were ready to return. David Coulthard saw what was coming. He gave up a tilt at the 1996 crown by leaving dominant Williams. Newey saw it, too, and made the same move, in a deal that can be counted among Dennis's most significant. 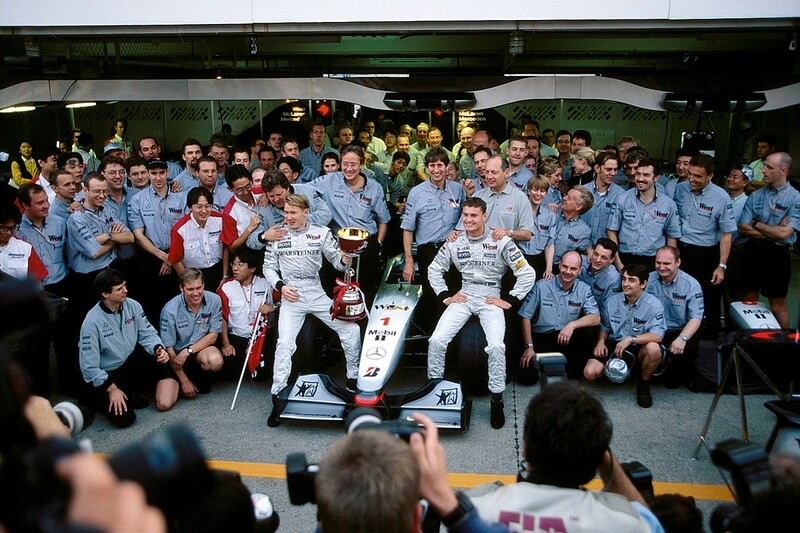 Breakthrough wins for Coulthard and Häkkinen ended a three-year drought for McLaren in '97, and then, armed with Newey's beautiful MP4/13 - finished in unfamiliar West silver after Marlboro ended 23 years of continuous support - Mika would rise in a manner some had doubted he could muster. He'd almost died in a horrible crash at Adelaide at the end of '95, saved only by a trackside tracheotomy. Yet here he was, just three years later, seeing off mighty Schumacher and a rejuvenated Ferrari in another Suzuka season finale. He did it cleanly, too, then repeated the feat - just - in 1999 after Schumacher broke a leg at Silverstone. Häkkinen versus Schumacher lacked the personal intensity of Senna vs Prost, but in its own way this was also a duel for the ages between two F1 titans. Mika took a different approach to defeating his enemy: simple, straightforward... refreshing. 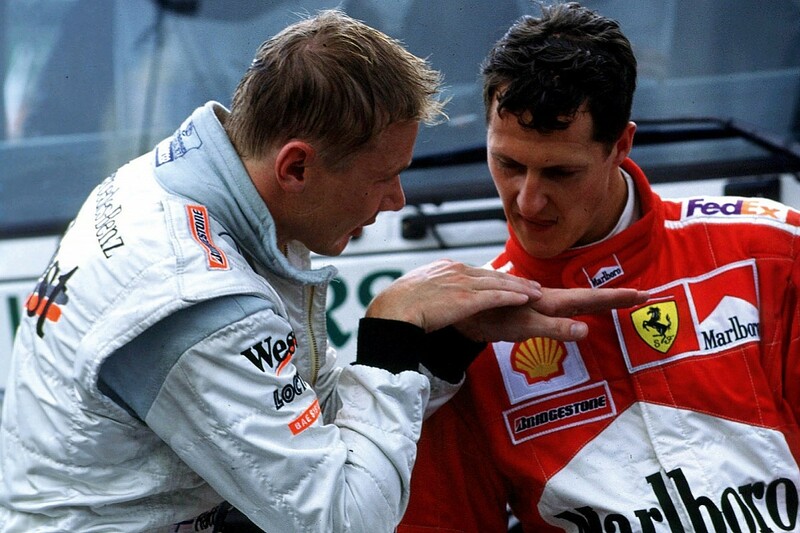 But there's nothing patronising in that: Häkkinen was not a man to be underestimated, as Schumacher would discover. Mika's magical pass up the Kemmel straight at Spa in 2000, the pair flashing either side of poor Ricardo Zonta in the backmarker BAR, should perhaps be considered Häkkinen's defining moment. The conversation between the rivals in parc fermé later, as Mika explained exactly why Michael putting him on the grass at 200mph the lap earlier had been less than advisable, was pure F1 gold. We didn't need to hear the conversation; Schumacher's stony face told the story. As a new century began, McLaren could reflect on a decade of pogoing fortunes, from the sublime to the ridiculous and back again. As Häkkinen departed, head held high with two hard-won titles, the team focused on yet another Finnish muse to carry McLaren forward. Kimi Räikkönen certainly looked the real deal. But for Ron Dennis, he had no way of knowing his best days at the helm were behind him. Trouble away from the tracks, and a particularly vindictive FIA president, were set to change McLaren forever.